Murdering Americans by Ruth Dudley Edwards: Synopsis and Online Purchase Options. Being a member of the House of Lords and Mistress of St Martha's College in Cambridge might seem enough to keep anyone busy, but Baroness (Jack) Troutbeck likes new challenges. 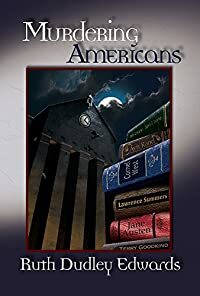 When a combination of weddings, work, and spookery deprives her of five of her closest allies, she leaps at an invitation to become a Distinguished Visiting Professor on an American campus. With her head full of romantic fantasies inspired by 1950s Hollywood, and accompanied by Horace, her loquacious and disconcerting parrot, this intellectually-rigorous right-winger sets off from England blissfully unaware that academia in the United States is dominated by knee-jerk liberalism, contempt for Western civilization, and the institutionalisation of a form of insane political-correctness. Will the bonne viveuse Baroness Troutbeck be able to cope with the culinary and vinous desert that is New Paddington, Indiana? Can this insensitive and tactless human battering-ram defeat the thought-police who run Freeman State University like a gulag? Does she believe the late Provost was murdered? If so, what should she do about it? And will she manage to persuade Robert Amiss—who describes himself bitterly as Watson to her Holmes and Goodwin to her Nero Wolfe—to abandon his honeymoon and fly to her side?